The Annunciation by George Hitchcock, ca. 1887. We might not realize that this is Mary, except for the faint halo around her head. The blue dress and lilies are symbolic, but they are presented in a real-world setting. 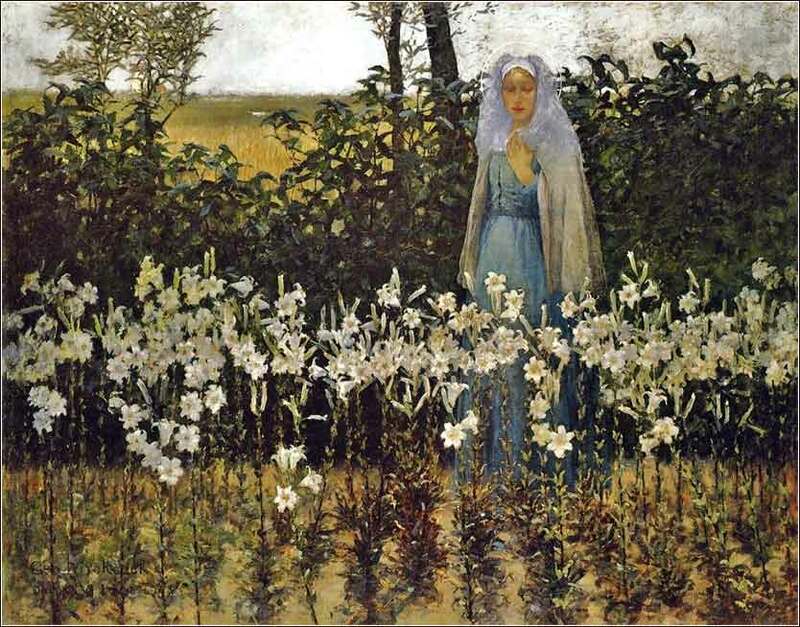 The lilies are not idealized, but growing as in an actual field, with grungy brown-spotted leaves. Her purity is internal and spiritual. These three modern settings of Mary’s Song (Holy is His Name) are charmingly (and appropriately) simple and pretty. The first singer, Annie Karto, is a dead ringer for Judy Collins. John Michael Talbot, who wrote the song, sings the middle section. The last performer, Jackie François, sings another updated version, My Soul Rejoices. and my spirit exalts in God my Savior. He has mercy in ev’ry generation. The second part is similar to a psalm of David; it is taken from the same poetic tradition and uses the standard poetic device of "parallelism", where one statement is followed by a second in the same meter, which either repeats the main idea or provides a contrast to it, such as "He hath put down the mighty from their seats" followed by "and exalted them of low degree". The theme, however, is very Christian and presages the Beatitudes (Matthew 5:3-11) Compare, for example, “he hath exalted them of low degree” to “Blessed are the poor in spirit: for theirs is the kingdom of heaven.” We get a sense of the timelessness of God, for in choosing humble Mary to bear the great King, God is fulfilling a promise that Christ will make 30 years later. 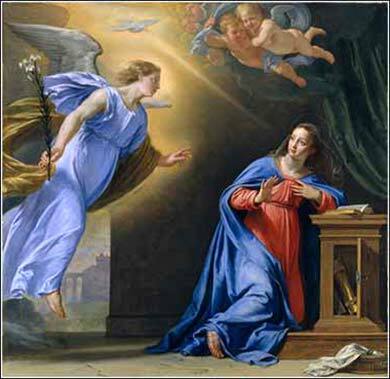 One might imagine that Mary became physically pregnant at the moment of the Annunciation, in accordance with the aspect of Jesus that is fully human, so that he already lives both physically and spiritually in her womb. Mostly, though, the meaning of the Magnificat is straightforward. It is worth reading through it slowly and letting each sentence sink in a bit. Mary, who is loved by Christians of all stripes and is venerated by many, voices a beautiful tribute to the God who has chosen her to bear His son.